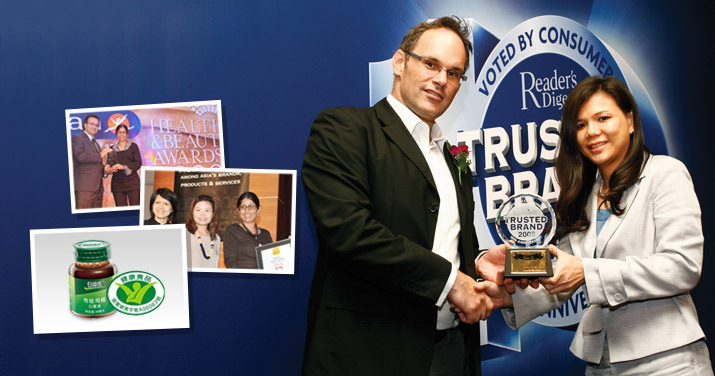 Singapore, 8 November 2006 - BRAND'S® has once again been awarded the Singapore Brand Award 2006. This is the fourth year in a row that BRAND’S® has been awarded this prestigious accolade by the International Enterprise (IE) Singapore. Innovation and a fine ear for the needs of the changing consumer market have been to the key successes of BRAND'S®. With over 170 years of heritage, BRAND’S® has earned the trust of consumers by placing much emphasis on the Research and Development of its products. It has won numerous accolades, including the Asia Trusted Brand Reader’s Digest 2006 Gold Award, and most recently the International Physiological Anthropology Design Award (IPADA) Grand Prize by the International Association of Physiological Anthropology (IAPA). These have been in recognition of the efficacy and benefits of its flagship product, BRAND'S® Essence of Chicken. This dedication to its consumers is illustrated by the innovative diversification of its products to suit the varying health needs of their lifestyles at different life-stages. The Singapore Brand Award was first organised by International Enterprise Singapore in 2002. The award is based on a brand valuation exercise that employs Interbrand’s established and internationally accepted proprietary brand valuation methodology. The valuation of Singapore Brands is based on more than brand perception and awareness. It accounts for the role and contribution of the brand to its organisation’s business. The Singapore Brand Award is only awarded to the Top 15 Most Valuable Brands. The winners represent companies with astutely managed brands that have succeeded in their very own ways in the global arena. The winning brands have leveraged on branding, to turn it into a key corporate asset, which in turns creates substantial value for their shareholders and contributes positively to their financial and business performances.